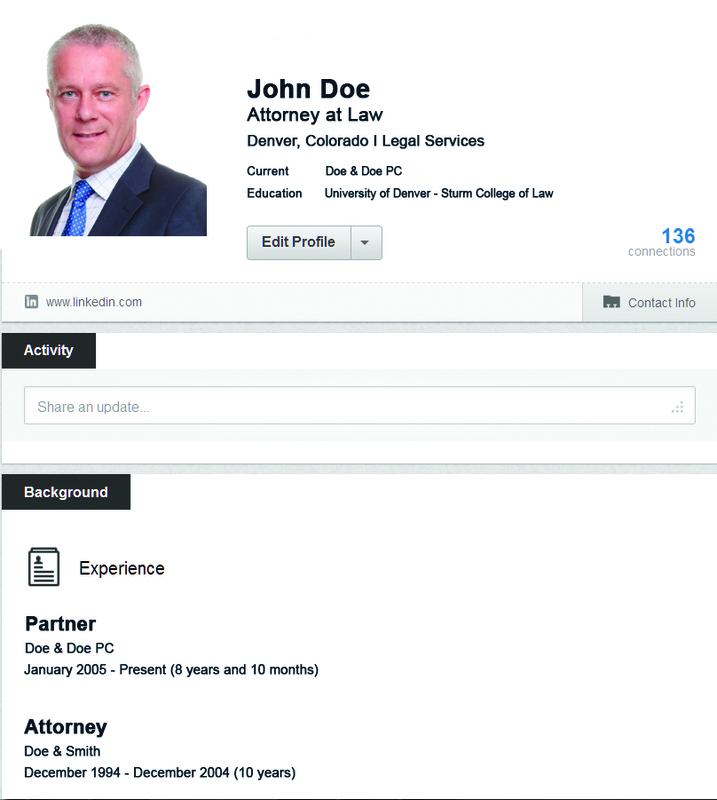 Until recently, very few lawyers and corporate counsel had even heard of the social media site LinkedIn. In fact, it surprises many to learn that LinkedIn was launched ten years ago. How quickly things have changed! Ninety-five percent of ABA members indicate that they have posted their profiles on LinkedIn. Seventy percent of corporate counsel indicate that they use LinkedIn regularly as a tool to find and vet outside counsel. These statistics come from a 2012 ABA survey. LinkedIn is now one of the world’s most popular websites. If you would like to be found by potential clients, your LinkedIn profile has become even more important than your website biography. If you are looking for networking opportunities, your LinkedIn presence and activity have become just as important as your face-to-face networking. LinkedIn launched in May 2003. “From the very start, LinkedIn differentiated itself as a site for business, business development and recruitment rather than a social site,” said Phil Nugent. Nugent discussed effective use of LinkedIn by lawyers and law firms at the monthly educational meeting of the Rocky Mountain Chapter of the Legal Marketing Association, held July 9 at Sullivan’s Steakhouse in LoDo Denver. Nugent is a non-practicing attorney and principal at NCG Strategic Marketing. “Successful use of LinkedIn as a business development tool has three steps,” said Nugent. “First, you must post a complete and compelling profile. All too many lawyers and law firms leave it at that, however, and then wonder why LinkedIn is not working as well as they had hoped. The creation and posting of a good profile is step one of a solid LinkedIn presence. However, it should not be the same as a lawyer’s website bio. Instead, it should be designed to satisfy the unique needs of LinkedIn’s search algorithm. Nugent discussed and gave specific recommendations regarding the algorithm’s weights. Name and title (25 percent) — Do not make the mistake of simply listing a generic job title in this very important space. It should include carefully selected keywords – the keywords that those searching for someone like you are likely to use. The title category can be as long as 120 characters, or about 18 words. Photo (5 percent) – A profile that includes a photo is seven times more likely to be viewed than one without a photo. Be sure that the photo is both professional and recent. Summary (10 percent) – Use your summary to tell a compelling story about how you help clients solve their legal problems. This section should include plenty of keywords. It can include up to 2,000 characters, or about 350 words. Spell check is always recommended. Another smart tactic for promotion of your LinkedIn presence is to customize your profile’s URL. LinkedIn automatically generates a random URL, but this easily can be changed to a much shorter version featuring your name. Additionally, you should be sure to add links to your website and blog. On the “Edit Profile” page you can add content modules that include projects, publications, honors and awards, patents, certifications and languages. Once you have prepared and posted a strong LinkedIn profile, you want to make sure that people can actually gain access to it. Go to the “privacy controls” section of your profile and choose the settings that allow “everyone” to view your profile photo and visibility. To support a strong LinkedIn profile, you need a strong network. When it comes to building a network, you can pitch as well as catch. This means that you shouldn’t rely only upon the invitations that you receive; you should proactively send invitations to those with whom you would like to be connected. A LinkedIn network works like a big circle, with you in the middle. First-degree connections are direct connections. These are the people you have accepted and who have accepted you. Second-degree connections are friends of these friends. Third-degree connections are friends of second-degree connections. Your level of visibility into third-degree connections is limited, and a request to connect must be routed through the second-degree connection that controls the relationship. “The quality of your network is important,” said Nugent. “If you accept too many random invitations, your network, although large, may not be sufficiently useful. If you accept (and send) too few invitations, you won’t be able to use the database as it was designed. When vetting an invitation, check out the inviter’s profile. Is the invitation from a real and (apparently) respectable individual? Does the inviter have quality contacts that might prove valuable? Does the inviter have a large number of contacts? Did the inviter include a personal note with the invitation? “Rely on these factors to determine if it makes good sense to connect,” said Nugent. When sending out your own invitations, start with your existing contact list. Include your firm’s partners, associates and staff; members of professional, business and industry groups that you belong to; and referral sources, clients and friends. Your LinkedIn network is essential when conducting pre-interaction due diligence. “You can search your network in order to find out useful information about prospects, their companies, clients, competitors, consultants, referral partners, media sources and employees,” said Nugent. “The quality of your results will be determined by the quality of your contacts and the size of your network. LinkedIn’s “advanced search” capability allows you to refine a search by relationship, location, current company, industry, past company, school and language. Search can be further narrowed by groups, years of experience, function, seniority level, interests, company size, Fortune ranking and date joined. Lawyers who want expanded search capabilities and additional functionality can try a premium membership on a monthly basis rather than sticking with the basic free membership. However, the free membership provides plenty of power for most LinkedIn users.